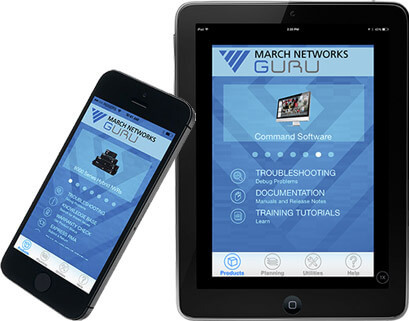 Our industry-first GURU Smartphone App automates typically time-consuming tasks so technicians don’t have to spend time booting up a laptop and connecting to the Internet or calling for technical support. With GURU, you can take advantage of your phone’s existing features to enhance efficiency and overall case management. Assess how secure the configuration of installed March Networks recorders is against a list of potential weaknesses with GURU’s Security Audits feature. Receive a list of recommendations on ways to harden the system, such as changing a default password. Read our disclaimer. Make networking adjustments on-site without your laptop with GURU’s innovative wireless provisioning capability. Just connect GURU to any March Networks 8000 Series or RideSafe NVR by plugging a wireless adapter into the recorder’s USB port. Then scan the QR code to make the wireless connection. Package reports and email in Word format to customers or supervisors for review and approval. Package all information in a PDF file and trace it as it passes from one person to the next in the investigation process.